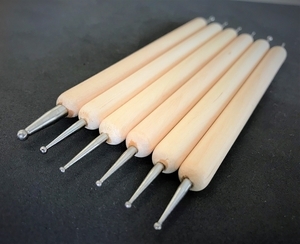 Embossing Stylus Set for Copper. This is a 6 piece Stylus Set, each double ended with a different sized ball tip, so the set overall has a total of 12 ball tips. The styluses are easy to use and are excellent for embossing/ tooling copper foil. These embossing tools work best with our 3, 5 and 8 mil copper sheeting.